It’s even better with homemade applesauce, which is super easy to make and so worth it. If you want to go the extra mile to make this even more delicious, add a dash of ground ginger and ½ tsp. of pure caramel extract. Bonus: We’ve included an additional vegan version of this recipe that’s made with apples instead of applesauce. 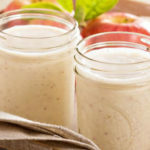 This Shakeology recipe tastes like a healthier version of apple pie! Place water, ice, Shakeology, applesauce, and cinnamon in blender; cover. Blend until smooth. Try a heartier vegan version of this delicious smoothie made with apple instead of applesauce! Place almond milk, ice, Shakeology, oats, apple, cinnamon, and cloves in blender; cover. Blend until smooth.